Storytelling + Research = LoiS: Foolishness? At first I called it my Annual Foolishness, then it became my Semi-Annual Foolishness, but now I guess it's just plain Foolishness. Back when I left the rigidity of a library schedule for storytelling, I tentatively let myself be cast in a play during a time when storytelling was less likely. My storytelling draws upon my undergraduate degree in Theatre Arts which included a sabbatical at a professional theatre, independent studies directing a touring children's theatre company, and another teaching acting. I guess that foolishness includes telling myself going back into shows throughout the year helps my storytelling. Truthfully it's really closer to letting myself become captivated by some shows and, in winter, locking myself into doing something without spending to go some place warm. If you go to Pontiac Theatre IV's website, you will discover my current "foolishness" is Anne of the Thousand Days by Maxwell Anderson. The production opens next week and will be held on March 11, 12, 18, 19, 2016 at the Michigan School for the Arts at 819 Golf in Pontiac. All performances begin at 8:00 pm. Ticket prices are $10.00 for adults and $8.00 for seniors and students. Tickets also may be reserved by calling 248-499-2360. Speaking earlier of being captivated, Maxwell Anderson was both a poet and dramatist with a love of history, especially Tudor history, writing three dramas about it in blank verse. While the play version doesn't have the settings of the movie, the stage version of Anne of the Thousand Days gives both the history, passion and intrigue of Anne Boleyn's life and execution, and that poetry. He doesn't do it in Shakespeare's iambic pentameter, but the imagery is definitely there. All of this, plus an invitation from director, AmandaJane Schade, to play Anne's mother, Elizabeth, the grandmother and namesake of Queen Elizabeth the First proved irresistible to me. In the process of getting my character developed I've discovered so much about the people involved. As Americans we may have seen the movie about Anne's sister, Mary, in The Other Boleyn Girl or even the BBC television mini-series, The Six Wives of Henry VIII, but Anne of the Thousand Days continues to show how little we know and intrigue us with what might have been in oh so many ways. Portrait believed to be of Elizabeth Howard Boleyn. As publicity for the show, cast members were interviewed and I think my responses give more reasons to see the show and why I find it worthy of talking about in a blog devoted to research and storytelling. 1) We've all heard of Henry VIII and Anne Boleyn, but many of us don't know the details...is there anything in this play that you think will surprise audiences in regards to this story and the people involved? People may know about the reign of Oliver Cromwell, but his uncle, Thomas Cromwell, was quite involved -- to say the least -- in Anne's marriage and later execution. English history isn't something Americans are as knowledgeable about as we should be, so this play does a beautiful job of letting us see the humanity behind the story. 2) Do you relate to the character you play in Anne of the Thousand Days? Why or why not? Elizabeth, Anne's mother, is a fascinating character in her own life and also as a woman who tried to be close to her children. She came from a position of nobility, wealth, and influence and was well-suited to all that happened throughout her life, including seeing how positions can change with royal favor. Since she's nothing like myself, except as a mother, I looked for someone who might help me portray her. Followers of the t.v. show Castle can understand how I found Castle's mother, Martha, a Grande Dame of the theatre (played by Susan Sullivan) an excellent role model. Don't know if my version will remind people of her, but she certainly gives me a target to attempt. 3) Tell me a little bit about your life outside of theatre. I'm a professional storyteller, coming from a background of theatre and librarianship. While I tell "stories from around the world and back through time", I confess that I especially love my historical "characters" I portray. They're not famous people, in fact I call it "history as seen by the 'average' person", but they have fascinating lives. I am currently developing the story of a woman from Marine City who was sent to France in World War I as a bi-lingual phone operator. I frequently portray a woman from Shelby Township who grew up on an Underground Railroad Station run by her abolitionist parents, her brothers were active in the Civil War, and her own marriage and family give a view of this area 100 years ago. In addition I have a "generic" one-room schoolteacher program and am sometimes "the Hired Girl" to tell about Victorian Christmas and other topics of the late 19th and early 20th century. 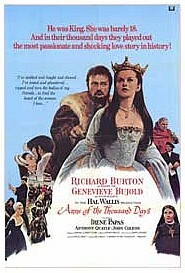 4) Why do you think people should people come see Anne of the Thousand Days? Aside from the fact that it gives that view into history I mentioned, it's beautifully written, almost poetic while never bogging down. Added to all of that, you will find yourself thinking about how history might have been very different. 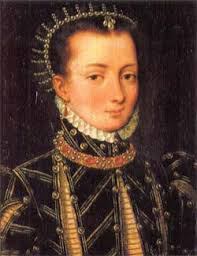 Anne truly loved and was engaged to the Earl of Northumberland, but King Henry broke it up; Henry and Anne had a tempestuous relationship, but it might have worked if they had produced a male heir; (love how gender is determined by the father and wish it had been known then! ); what if Henry had only realized what a great monarch his daughter, Elizabeth, would become as many consider the greatest monarch in English history? Those who enjoy alternate histories have plenty to enjoy in this story. I'll leave the possibility of those alternate histories to the imagination of others and return to the research and how it might affect any storytelling about the Tudor era in my next two weeks. Next week I'll give sources and portraits of the people so involved in the tale. Then the following week will tell about the many ghostly places where Anne Boleyn has been seen. She earned the title of the most famous ghost in England and seeing Anne of the Thousand Days it's easy to believe she would want to return. Hope you come to the show, but even if you can't, I hope you enjoy looking into the history that inspired it.